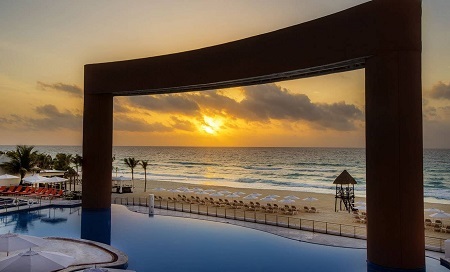 Luxury All Inclusive Beach Palace Cancun Resort in Cancun, Mexico! Bid Per Person Per Night & Choose Your Length of Stay! A vast stretch of sandy white beaches and blue ocean waters welcome you as you make your way to the beach area. It’s like stepping into a postcard. 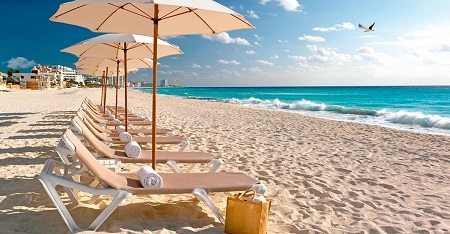 Embrace Beach Palace, and savor flawless beaches, turquoise waters, exotic tours and scintillating nightlife options. Offer is based on a Double Occupancy in a Deluxe Resort View. Close the door and leave the world behind in this stately suite, brimming with luxury and posh décor. Savor a delicious breakfast or lunch while relaxing on your private balcony—order anything you like using the 24-hour room service amenity. Designed for up to 4 guests, including children and infants, the entire family can sleep comfortably and vacation in total luxury. Upgrade to a Superior Deluxe Lagoon View for an additional + $5.oo per person per night. This haven of luxury overlooks the stunning Nichupte Lagoon. 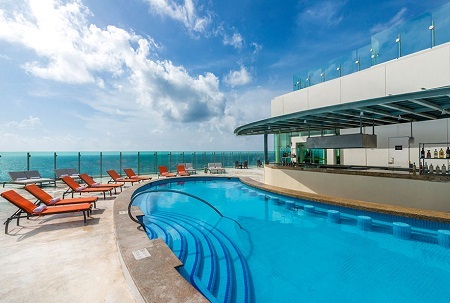 Soak in its grandeur from your private balcony. This suite boasts either 1 king or 2 double beds, and a Smart TV with YouTube, vTuner and Weather Channel, so you can kickback and enjoy a great movie or TV show. There is also a Double Whirlpool Tub for indulgent and relaxing treat. If you’re feeling lively, you can get your party on with your in-room mini-bar stocked with sodas, bottled water, juices and imported beers. 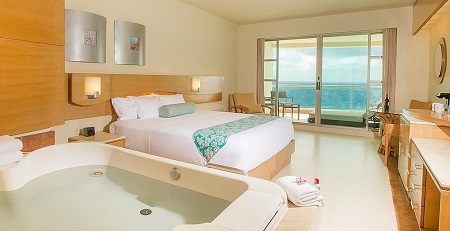 Upgrade to a Superior Deluxe Ocean View for an additional + $10.oo per person per night. Embrace the day marveling at the Caribbean Sea’s pristine blue current and its gentle sway of tides all right from your private balcony. The ocean breeze will replenish your mind and stir your soul. This suite accommodates up to 4 guests, including children and infants. The suite is equipped with either 1 king or 2 double beds, and enjoy the abundant in-room amenities provided in all Beach Palace guest rooms and suites. Up the level of indulgence with our Concierge Level suites, located on floors 5 thru 10. In addition to our standard amenities, guests staying in these rooms will also enjoy the following upgraded amenities: L’Occitane bath amenities, two massages, nightly petit fours with your turndown service, upgraded liquor brands in dispenser, bathrobes & slippers so you can make yourself comfortable while relaxing in your suite, and complimentary red wine upon your arrival. All rooms and suites at Beach Palace are non-smoking. Max Occupancy: 2 guests. 440 Sq. Ft. The living space includes a - 1 King size bed. Pillow menu - Professional Hair Dryer and Chi products - Beach bag - Espresso/American coffee - Room service menu - Turndown - Petit fours nightly - Electronic safe - Individually controlled a/c - Bathroom with double jacuzzi - Balcony with doublé bed /2 chairs and 1 table. Upgarde to a Family Deluxe for an additional + $125.oo per person per night.